THE BURRINJUCK DAM was built across a gorge of the Murrumbidgee River, New South Wales, just below its confluence with the Goodradigbee River. The dam is 236 feet high, with a width of 168 feet at the base, tapering to 18 feet at the top. The crest of the dam is 780 feet long. There is a spillway on either side of the dam to carry off overflow water, in addition to four 4½ feet valve openings in the base of the dam. The dam, which was completed in 1914, has formed a reservoir with a water surface area of 12,780 acres, with a maximum depth of 200 feet. DROUGHT and dry seasons have long been the terror of the farmer and cattle-raiser of the Australian Commonwealth. The drought which Australia suffers is brought about by the peculiar physio-graphical formation of the country. Rising some thirty to fifty miles from the coast there runs, virtually round the entire continent, a thick belt of mountains. They give a picturesque charm to the land, but unfortunately bar the passing of rain clouds, so that the great inland plains are robbed of the necessary rains, and crops and cattle are often liable to suffer from want of water. The rainfall in the mountains is excessive and at the time of the melting of the snows on the higher peaks the rivers are in flood. These floods occur with amazing suddenness. Excessive floods are often followed by periods of drought when crops fail and cattle are lost through inability to feed and water them. These were the conditions that faced the farmer in many of the States of the Commonwealth until irrigation engineers went to the mountains, collected and stored the flood waters behind massive retaining walls, to be carried as needed by canals to the thirsty plains. These water conservation schemes in the Commonwealth equal in size and daring similar undertakings to be found in India and Egypt. The work has been done by Government engineers often far from the centres of civilization, in wild and mountainous country. Though these undertakings are entitled to rank as major engineering works little has been heard about them. The most recent of these achievements and the greatest undertaking of its kind so far carried out in the Antipodes is the building of the Hume Dam, completed in November 1936, on the Murray River. This mammoth retaining wall is a mile long, has a maximum height of 150 feet and is capable of impounding 1,250,000 acre feet of water (an acre foot is the volume contained in an acre of water 1 foot deep). This is about double the capacity of the Sennar Reservoir in the Sudan. The area of land submerged by the Hume Dam amounts to 33,000 acres, or nearly two and a half times that of Sydney Harbour. Upon the dam alone £5,500,000 have been spent, but another £7,000,000 will be needed to complete the weirs, locks, system of canals, and storage basins which are being built in connexion with the project. This work will irrigate between 3,000,000 acres and 4,000,000 acres of pastoral land, hitherto unreliable for the cultivation of crops as it was subject to drought at various times. The Murray River has been aptly termed Australia’s Nile. It is the principal and longest river in the Common wealth. Rising in the bleak and windswept ranges of the Australian Alps, it flows along the frontiers of New South Wales and Victoria into South Australia, entering the sea at Encounter Bay. It is 1,250 miles long, and population of about 70,000 lives along its banks. The river drains an area of 270,000 square miles. It is navigable as far as Albury, ten miles from the site of the dam, some 300 miles from the river’s source. 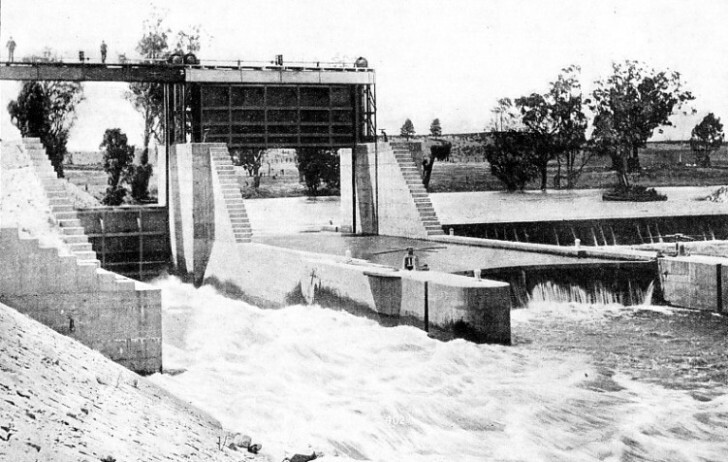 Just as the irrigating engineer has thrown barrages and dams across the Nile in Egypt to control the flow of the river for irrigation, so have the engineers of the Commonwealth erected weirs across the Murray for similar purposes. There are over a score of these weirs with their locks. Many of the weirs are elaborate concrete structures fitted with sluice gates. Their object is to raise the level of the water and divert a portion of it into channels by which it is carried to the thirsty plains, in some instances a hundred miles and more distant. By the side of the weir are the locks which enable boats to pass up and down the river. Weir building is specialized work, demanding careful planning and high organizing skill. THE MURRUMBIDGEE IRRIGATION PROJECT has brought a regular supply of water to the Riverina, a district of New South Wales, 1,500,000 acres in extent. The Burrinjuck Dam was built a short distance below the confluence of the Murrumbidgee and Goodradigbee Rivers, nearly 300 miles from Berrembed and the area to be irrigated. At Berrembed are the head works of the irrigation canal system and the weir across the river. With a river running through three different States, each State desirous of using some of the water for irrigation, it essential for all concerned to be in agreement as to the quantity that should be taken. Furthermore, the Murray is an important artery, and there is a considerable passenger and freight traffic up and down the stream. So a special body was formed, the River Murray Commission consisting of experts from the three States concerned, to deal with the control of the river. They recognized that no substantial increase in the number of weirs was possible unless something was done to guarantee a regular flow of the stream throughout the year. In seasons of flood the Murray rises rapidly, sometimes as much as 15 feet. If this surplus water could be caught and stored it would provide all and more than was needed. So it was decided to throw up a retaining wall in the upper reaches of the river and so create among the mountains a great storage reservoir which could be drawn upon as desired. After exhaustive surveys it was decided to build a dam across the Murray River at its junction with the Mitta Mitta River, ten miles upstream from Albury, on the borders of New South Wales and Victoria. Originally known as the Mitta Mitta Dam, the great work has now been named in honour of Hamilton Hume, the explorer. Hume and Hovell, with a small band of pioneers, were the first white men to discover the upper reaches of the Murray River. That was in 1824. Two and a half miles above the present site of the dam they converted their wagons into waterproof rafts by removing the wheels and stretching canvas underneath. Then, swimming their horses, they navigated the balance of their gear across the river on their perilous journey south, through unknown country, towards Bass Strait, separating Australia from Tasmania. The dam is a concrete and earthen structure. The concrete section, forming the spillway and outlet works across the river, has a length of 1,042 feet, with a maximum height above the river bed of 150 feet and a width at the base of 104 feet. The earthen section, 4,246 feet long, has a width at the base of 762 feet, tapering to 32 feet at the crest. The building of this great retaining wall called for 578,000 cubic yards of concrete and 4,300,000 cubic yards of earth. 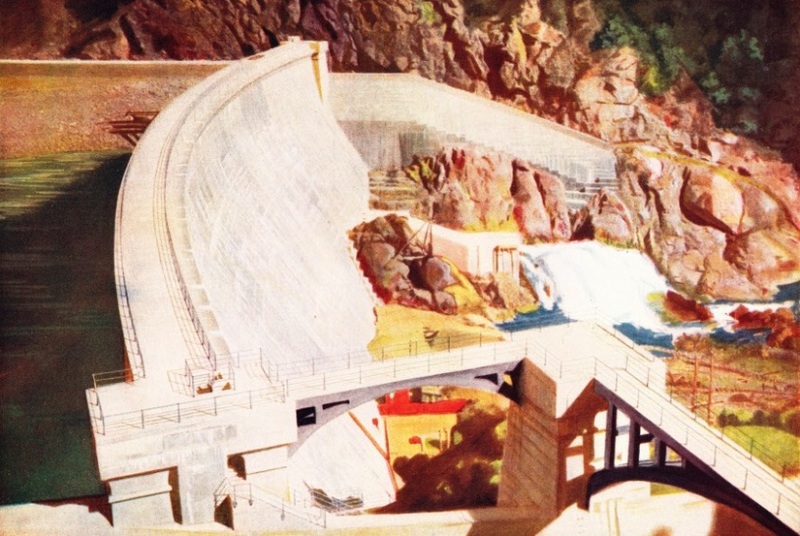 It is fitted with twenty-nine spillway gates and seven valve outlets. One of the major initial difficulties confronting the engineers was locating suitable rock foundation for the concrete portion of the works. Twenty-five sites were tested by diamond drill, but at none of these could a continuous rock bed be discovered at less than 140 feet. At last, after 158 bores had been sunk, a site was found which gave a hard granite base at an average depth of 40 feet right across the valley. Upon this site the rampart was built. with flood waters which swamped the works, but the engineers were equal to the occasion and no serious damage was done to the permanent structure. The dam has created a huge reservoir, holding up the waters of the Murray and Mitta Mitta Rivers for a distance of 50 and 25 miles respectively. The catchment area is 6,000 square miles, and the present capacity of the reservoir is 1,250,000 acre feet of water, sufficient to meet the requirements of the present population of Melbourne for twenty-five years. The dam, however, has been so designed that it can be enlarged, thereby increasing the capacity of the reservoir to 2,000,000 acre feet. Similarly, arrangements have been made for the establishment when needed of a hydroelectric plant at the site. The flow from the reservoir is controlled by seven offset valves. These outlets discharge into a stilling pool 180 feet wide and 293 ft 6-in long, This masonry structure is 22 feet deep, and the body of water within will cushion the shock of discharge and guard against erosion of the river bed. HUME DAM across the Murray River was completed in November 1936. Built at a cost of £5,500,000, it is designed to irrigate between 3,000,000 and 4,000,000 acres of pastoral land. The length of the concrete section, which contains the spillway and outlet valves, is 1,042 feet Earthworks extend for an additional length of 4,246 feet. The water surface impounded has an area of 33,000 acres. The highest flood recorded past the site of the reservoir was about 90,000 cubic feet a second. 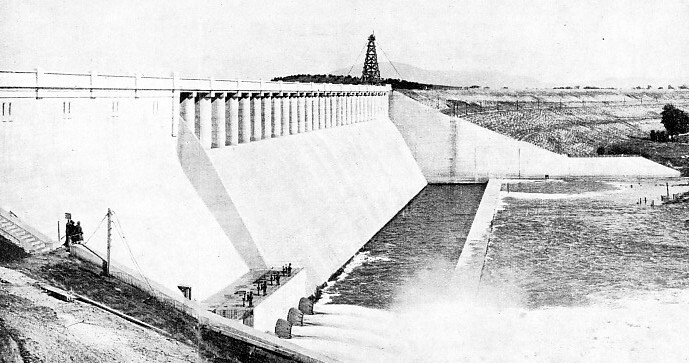 After intensive experiment, an “energy dissipator” was built, consisting of a concrete trough 80 feet wide and 25 feet deep, which will defy the fiercest onset of the heaviest floods The lip of the spillway is 15 feet below full supply level, and for this depth twenty-nine gates, each 20 feet long and 15 feet high, retain the water. When it exceeds the level of full supply, the gates are lowered down the face of the wall by electrical mechanism to allow the surplus water to pass away. Many thousands of pounds’ worth of construction lie deep, for ever out of sight. An important feature of these works is a reinforced concrete core wall extending through the centre of the earthwork embankment from a point 4 feet below the crest into the solid granite about 50 feet below the ground surface. Behind the core wall is a layer of broken stone, and at the bottom of this is built a semicircular drainage and inspection tunnel 6½ feet high. On the upstream face of the dam a layer of coarse gravel was spread, and upon this concrete slabs 6 feet square by a foot thick were placed to counter the force of waves that will come rolling across this inland sea in time of storm. Berrigian, each about 600,000 acres in extent, situated some 150 river miles from the reservoir, are being brought immediately under irrigation. This scheme has necessitated the building of elaborate works and hundreds of miles of canals and distributing channels. One of the most spectacular of these water conservation schemes is that carried out by the engineers of the New South Wales Government. The Murrumbidgee Irrigation Project entailed the building of a great dam in a deep gorge down which ran a turbulent river, the creation of a large lake among the mountains and the carrying of water from this reservoir a distance of 266 miles to irrigate a rich tract of territory, known as the Riverina district, 1,500,000 acres in extent. Five years were occupied in building the dam and there ensued a stern battle against the forces of Nature. When the great retaining wall stood complete in 1914 it could claim to be the greatest dam in the British Empire. A sum of £7,949,800 was spent upon the project. This amount included the cost of a dam, a weir, canals, channels, roads, bridges, a large experimental farm and a butter and canning factory. The undertaking was a commendable attempt to popularize the land and make farming attractive. 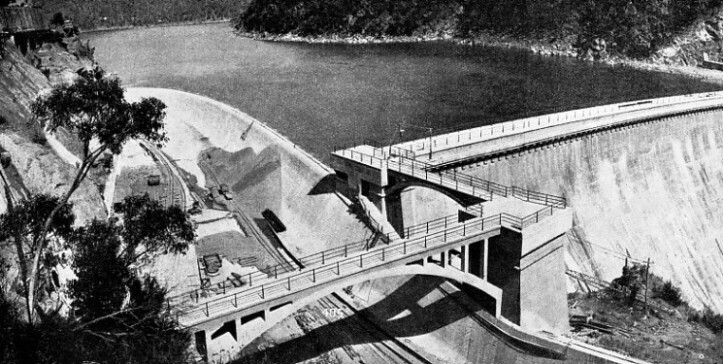 THE CYCLOPEAN PRINCIPLE was used in building the Burrinjuck Dam. A number of cruciform units of concrete, measuring 9 feet, 12 feet and 15 feet in height, were made and placed so that adjoining units broke joint horizontally and vertically. The units were built up of heavy timber and concrete was run in to make a bed. In the concrete were embedded boulders or “plums”, each of them averaging about 15 tons in weight. More than 50,000 tons of cement were used. The Riverina district has always been famous for its fine merino wool. Although the soil is exceedingly rich, the rainfall is always scanty in the summer months, and therefore the cultivation of crops was attended with considerable risk before the water was available. To-day, as a result of irrigation, the Riverina is one of the richest fruit-growing districts in the Commonwealth. Large crops of citrons, pears, peaches, apricots, nectarines, almonds, melons, grapes, raisins and currants are profitably grown, as well as all kinds of vegetables, maize, and from four to as many as eight crops of lucerne in the year. The growing of rice is now an important industry. The annual crop amounts to between 25,000 to 30,000 tons, more than the whole of Australia’s needs. Dairy farming, tobacco growing, pig raising and lamb fattening have also been taken up with success. Lengthy surveys were carried out among the mountains with the idea of finding a suitable site for a dam on the upper reaches of the Murrumbidgee River, which skirts the Riverina district on its way to the Murray River. It was decided to build the dam across a deep gorge just below the confluence of the Murrumbidgee and the Goodradigbee Rivers. On one side of this gorge rises the Black Andrew Mountain, on the other side the Burrinjuck, whose summit is 2,200 feet above the river bed. The Murrumbidgee watershed is 5,000 square miles in extent, and on the higher elevations the annual rainfall is as much as 60-in to 70-in. Some of the peaks rise to 5,000 feet above sea level and are deeply covered in snow in the winter. Before work on the dam could be put in hand it was necessary to provide a more easy means of access to the site, for no roads or even paths existed. A 2-feet-gauge railway was built from Goondah, on the main Sydney-Melbourne line. This place is twenty-six miles from the site of the dam, and the line, although purely an initial undertaking, was in itself a work of some difficulty. In surveying it the engineers had frequently to be lowered over precipitous rocks to take their levels and measurements. For a considerable distance a ledge had to be blasted out of the sides of the mountains. The serpentine line winds in and out among the mountains, here and there making curves with a radius of 100 feet. 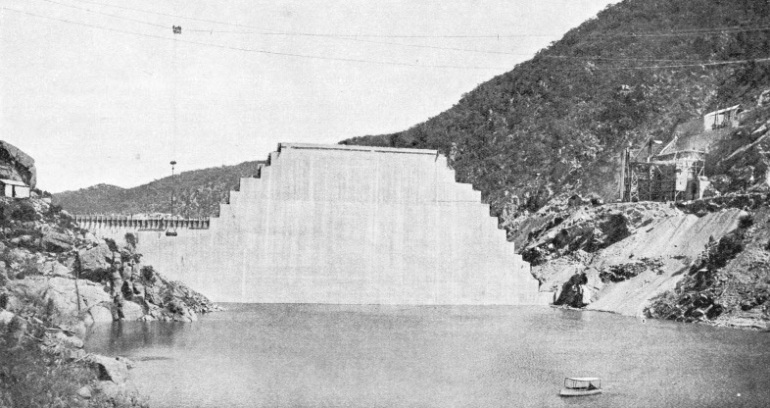 UPSTREAM FACE of the Burrinjuck Dam in the course of construction. The dam has a height of 236 feet and is 168 feet wide at the foot, tapering to a width of 18 feet at the top. The dam measures about 780 feet along the crest. As soon as the line had been finished armies of men, with stores and equipment, electric and steam plants, were carried to the site of the dam and soon Burrinjuck City sprang into existence. This “city” was never imposing. Its streets ran up and down a gorge so steep that horse-drawn vehicles could not traverse them. The houses were built mostly of canvas and corrugated iron, but they were roomy, airy and comfortable. Married men had cottages of their own, and single men were housed and catered for in huge barracks. A school and a hospital were provided also. For five years this city among the mountains was the scene of great activity, and during that period the inhabitants waged a strenuous battle against floods and other forces of Nature. To-day the city is no more, for as the great wall across the gorge rose higher and higher, so the waters of the lake crept up and up the main thoroughfare. The former officers’ quarters that looked down upon the streets are now a boat-house on the edge of a broad and deep lake. A succession of difficulties was experienced in getting out the foundations for the dam. The operation took two years and was frequently interrupted by floods, which would rise suddenly and swamp the works. On one occasion 5-tons and 10-tons cranes were swept away, despite lashings and heavy weights, and were carried fifty miles downstream before they were recovered. Even when the excavations for the foundations had been completed work on the dam itself could be carried on only in the height of summer when the river was low. During the first year luck was with the engineers, the season being dry, but in the following summer the rainfall was heavy and the river was constantly in flood. A staging, or perhaps a shop on a narrow ledge at the base of the cliffs, erected after weeks of strenuous toil, would be swept away in a single night. THE WEIR AT BERREMBED, some 220 miles downstream from Burrinjuck Dam. The weir, built along the line of a natural granite bar across the river bed, has an overall length of 270 feet. The structure includes a sluiceway 40 feet wide, a navigational lock 40 feet wide and 165 feet of movable wickets or collapsible shutters. Before work could be begun upon the dam proper it was necessary to obtain some control over the stream. Accordingly on its western bank a deep channel was patiently hewn at the base of the precipitous cliffs. When this had been completed a temporary cofferdam was formed across the bed of the river above the site of the dam and the water was turned into the channel by this means. When this had been accomplished the first task was to remove the loose stones and rocks lying within the area of the cofferdam. This task called for the disposal of many thousands of tons of debris. When this debris had been removed the underlying rock was found to be hard granite, and every cubic foot that was taken out had to be blasted. To remove the debris and to handle the material which was afterwards used to form the dam, the gorge was spanned along the site of the dam by three cable-ways, each 1,200 feet long, supported on towers 33 feet high. The cables had a sag of 60 feet and an elevation at the lowest point of 320 feet above the river. The maximum capacity of the cables was a load of 15 tons. The cables, drills, concrete mixers, cranes and all other plant were operated by electric power obtained from a power station, space for which had to be quarried out of the mountainside. The dam, which has a height of 236 feet, is 168 feet wide at the base, tapering to 18 feet at the top. It measures about 780 feet along the crest and is built on the “cyclopean” principle - that is, of concrete worked with large stones. The engineers adopted a system of cruciform units having an area of 1,080 square feet. These units were built to heights of 9 feet, 12 feet and 15 feet, and were so arranged that adjoining units broke joint horizontally and vertically. The units were built up of heavy timber baulks, and concrete made with broken stone, which had passed through a 2-in mesh, was run in to make a bed. In this concrete, boulders of an average weight of 15 tons, technically known as “plums”, were embedded. More than 50,000 tons of cement were used. To give the river a free passageway as the dam began to rise above the bed and the level of the diverting channel, a tunnel 28 feet in diameter was formed through the base. This tunnel was subsequently closed. In addition, a valve house, provided with four 4½-feet valves, was built in the base of the dam, but even these openings were insufficient to carry off the vast volumes of water which sometimes came down the river. The throwing of this gigantic retaining wall across the gorge has held up the Murrumbidgee River for a distance of forty-one miles, and the Goodradigbee and Yass Rivers for fifteen and twenty-five miles respectively. Thus the storage reservoir is an irregularly shaped lake buttressed by mountains, with a maximum depth of 200 feet and a water surface area of 12,780 acres. The capacity of the reservoir is 33,612,671,000 cubic feet, or 771,641 acre feet. 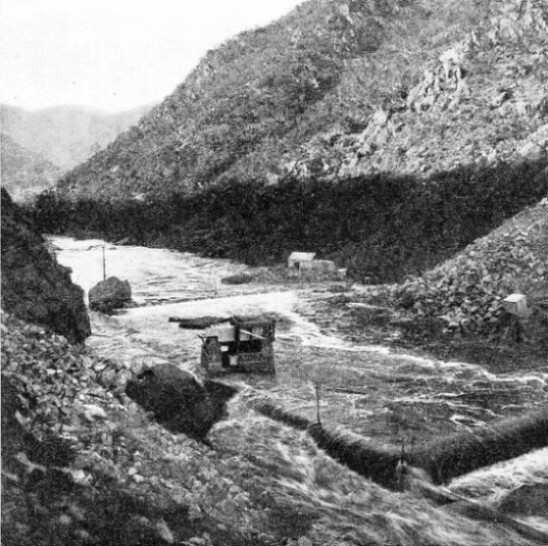 ONE OF THE CABLEWAYS across the gorge by which debris was removed from the cofferdam and material was handled for building the Burrinjuck Dam. The gorge was spanned by three cableways, each 1,200 feet long, and supported by towers 33 feet high. The cables had a sag of 60 feet and at their lowest point were 320 feet above the river. They took a maximum load of 15 tons. PASSAGE FOR THE RIVER was provided for, when the retaining wall had risen above the level of the diverting channel, by a tunnel 28 feet in diameter through the base of the dam. This tunnel was later closed up. In addition, a valve house with four 4½ feet valves was provided. At Burrinjuck two spill ways, have been provided, one on either side of the dam. These are cut out of the rocky sides of the gorge and do not form a part of the main structure They are nearly at the same level as the crest of the dam itself. The spillway channels are carried some little way down below the dam, and are then turned inwards in such a way that the waters they carry are diverted into the river channel, arrangements being made so that the two streams, one from each channel, meet on the river bed and break each other up. This was done to reduce the scour which would have occurred had there been only one spillway. To prevent any cutting back action from this water or from any water which might come over the crest of the dam, a low weir was built below the dam. The water is allowed to flow down the channel of the river to a point 220 miles from the site of the dam at Berrembed, where are situated the weir and head works of the irrigation system proper. At this point it was found that a solid granite bar stretched across the river bed. On this bar a foundation of concrete, 24½ feet wide and 3 feet thick, was laid, and on this the diversion weir was built. This has an overall length of 270 feet between abutments, and is divided into a sluiceway 40 feet wide, a lock 40 feet wide capable of taking barges or steamers up to 100 feet in length, and 165 feet of movable wickets or collapsible shutters. The sluiceway is on the northern bank. The walls of the lock are formed of concrete, and are 185 feet long, 8 feet thick and 16 feet high. The sluiceway and lock chambers are each controlled at their upper ends by single iron-frame sluice gates. The total lift of the gates is 35 feet, which is sufficient to clear the highest recorded flood by 2 feet. 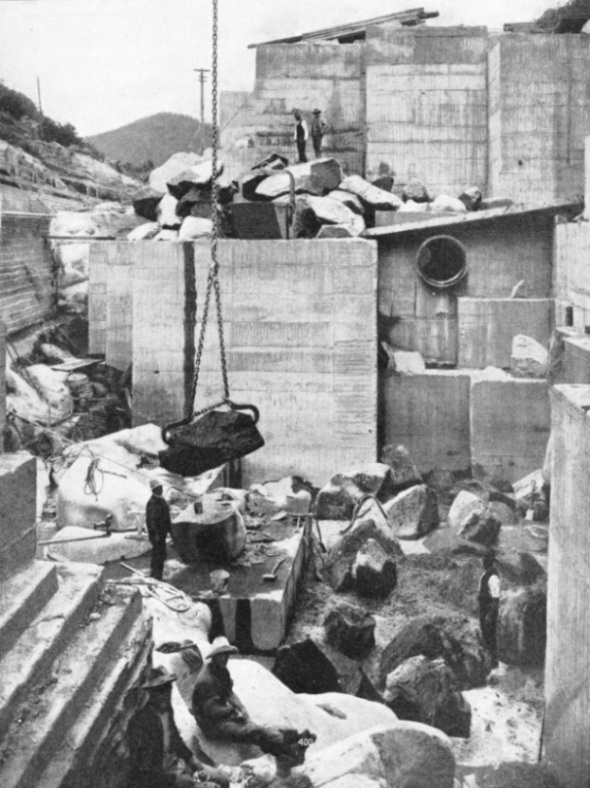 SEVERE FLOODS often seriously impeded work on the Burrinjuck Dam. Floods rose suddenly and would swamp the cofferdam, as shown in this photograph. On one occasion 5-tons and 10-tons cranes were carried fifty miles downstream. The main canal is a cutting 64 feet wide at the water level. A flow of water 8 feet deep gives a discharge of 1,000 cubic feet of water a second, the fall being 9-in to the mile. Five and a half miles from the headworks is Bundigerry Creek. The channel of this stream is made to take up the duty of the main canal for a distance of twenty miles. Below the Creek the canal skirts the base of the foothills and at this point begins its practical work in filling the distributing channels which form a network over the plains. The main canal is about 100 miles long, and there are many hundreds of miles of distributing channels and minor subsidiary channels with varying widths and depths, and arranged with easy gradients. Drainage channels are provided to carry off the surplus water. In this way a tract of virgin country, 1,500,000 acres in extent, with a rich soil and needing only a regular supply of water to return a rich harvest, was opened up to settlement. Upon it two towns, Leeton and Griffith, in railway communication with Sydney and Melbourne, have sprung into being. A large experimental farm has also been established by the Government to show the settler what crops he can best produce. A large butter factory, fitted with every modem appliance and cooling apparatus, which is worked by electricity and is capable of dealing with the produce of 10,000 cows, has also been built, as well as cheese and canning factories. The method in which the land has been laid out is interesting. Immediately round the two new towns are plots of two acres. Outside these are larger plots, and beyond these again are the large farms and orchards, all fed with water by a network of channels. Thus each settler, irrespective of the size of his plot, has his own water supply, with a small water wheel which measures and registers the quantity taken. But the water is needed only during the summer months, the average rainfall during the winter months being seven inches. Other important irrigation schemes carried out in recent years include the Biden Weir and the Waranga Reservoir, in Victoria, which, with other water works in that State, impound 1,351,860 acre feet of water. The various Water Boards of New South Wales control an area of 8,000,000 acres, more than twice the area of Yorkshire. The land is irrigated by water brought from distant mountains and rivers by hundreds of miles of canals. The Wyangala Storage Reservoir, with a capacity of 300,000 acre feet, was completed to provide a stock and domestic supply to 850,000 acres of Crown Lands in the west of the State. All over the Commonwealth extensive water conservation systems have been carried out during the last quarter of a century for supplying water for stock and domestic purposes to large areas of wheat and sheep country. The largest of these and one that has no equal anywhere in the world is the Wimmera-Mallee Waterworks in north-western Victoria. This waterworks consists of 6,120 miles of artificial channels serving 11,000 square miles of excellent wheat-growing country. In South Australia the irrigation engineer has won many victories in his fight against the drought menace. A particularly daring scheme was the creation of the Lake Victoria Reservoir, which called for the building of a great dam by which 514,000 acre feet of water are conserved and carried as needed to the thirsty land. South Australia has also a great network of pipes. The area supplied with water for stock and domestic purposes by this single system aggregates about 20,000 square miles, more than double the area of Wales. On Eyre Peninsula, South Australia, looked upon until a few years ago as of little agricultural value, a large tract of country has been reclaimed for the cultivation of wheat. The water is brought from a reservoir in the mountains 240 miles away. The total length of the main irrigating canals in the State is 5,859 miles. Another outstanding water conservation scheme is that at Mandaring, in Western Australia, whence water is carried to the Kalgoorlie goldfields, 352 miles away. 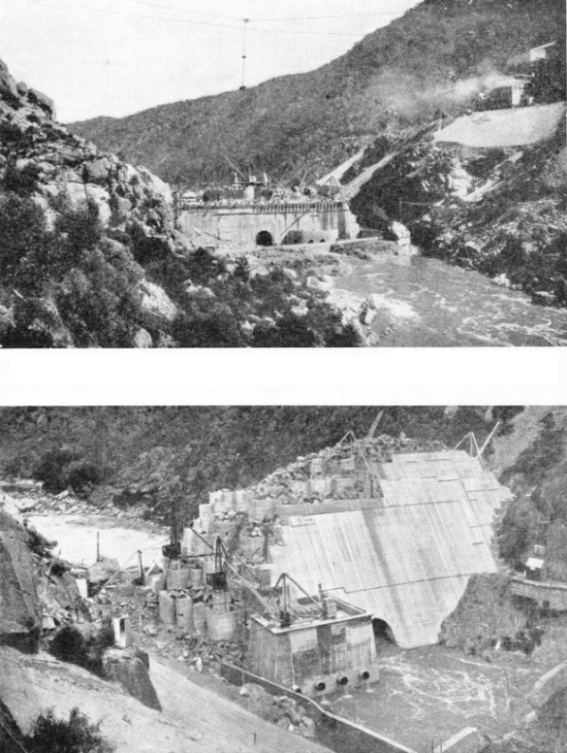 TWO SPILLWAYS were provided, one at either side of the Burrinjuck Dam. They are nearly at the same level as the crest of the dam. The spillway channels are carried some distance below the dam and turned inwards, so that the two streams meet and neutralize their respective scouring actions. Burrinjuck Dam has formed a lake with a maximum depth of 200 feet and a water area of 12,780 acres. You can read more on “Conquest of the Desert”, “Fighting Famine in India” and “The Nile Under Control” on this website.